A US mobile phone news company is suing its former employee in respect of the ownership of his Twitter account. Noah Kravitz worked for the company, PhoneDog, between 2006 and 2010 as a product reviewer and video blogger. During this time, his Twitter account with former username @PhoneDog_Noah gained over 17,000 followers. According to the lawsuit, filed in July 2011 in the US District Court for Northern California, PhoneDog alleges that they asked Kravitz to relinquish the Twitter account including his thousands of followers. 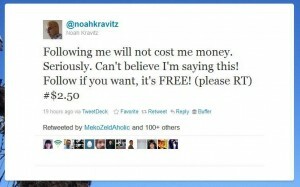 Instead, Kravitz changed his username from @PhoneDog_Noah to @noahkravtiz and kept the thousands of followers. PhoneDog seeks damages of $340,000 (£217,000) calculated on the basis that each follower was worth $2.50 per month to the company over the course of the eight months between October 2010 and the date of the lawsuit. Who owns a Twitter account maintained by an employee on behalf of an employer or closely linked to an employer when the employee leaves their employment? Similar issues still exist in respect of LinkedIn connections and other social media accounts. What is the value of a Twitter follower? Who owns the Twitter account? There are, however, ways in which employers and employees can be more prudent when operating social media accounts. Woodsie Girl has blogged recently about common social media pitfalls and tips for avoiding them. As she notes, it is indeed interesting how the question of ownership has already arisen in the UK when Laura Kuenssberg was able to change her Twitter username from @BBCLaura to @ITVLauraK when she changed employer, allowing her to keep her 60,000+ followers. One of the best ways in which PhoneDog could have had more certainty would have been to implement a well-drafted social media policy. details of who will ‘own’ social media contacts. If you are responsible for your practice’s page on a social media site, it will be the practice that owns the content and contacts, whereas the contacts on your own personal page on a social media site belong to you. If PhoneDog had considered such points in a social media policy, they might have been in a stronger position. Nevertheless, it appears from reading one of Kravitz’s latest tweets that the company had indeed already discussed the issue of who owns the followers, potentially placing them in a weaker position. Indeed Kravitz himself told the New York Times that he agreed with PhoneDog that he could keep the followers if he continued to tweet about PhoneDog. As could be expected following worldwide coverage of the action, Kravitz has gained many followers since the action began (around 7,000 additional followers as at 28 December 2011). Has the value of his Twitter account, therefore, increased by $17,500 per month? Probably not. And if the followers were actually so important to PhoneDog in the first place, why don’t they just actively follow them through their main @PhoneDog Twitter account which itself has over 14,000 followers? Chances are if they are real people and actually cared about the PhoneDog tweets in the first place, they will probably follow them back. Ranking Law Firms on Twitter by Klout: When will it end?